The Smithsonian National Museum of Natural History’s (NMNH) mission is succinct: Understanding the natural world and our place in it. The complication comes in putting this far from simplistic plan into practice, as Deborah Hull-Walski knows all too well. Hull-Walski, M.S. ’88, is a collections officer for the museum’s Collections Program in the nation’s capital. The work is daunting and challenging on a daily basis given the museum’s 145 million items. Among all that has been preserved are more than 2 million cultural artifacts, an excess of 4 million pressed plants and 35 million insects. It is no wonder the museum ranks as the largest and most frequented natural history museum in the world. The varying dimensions are just one fasciation for visitors. There were 3.8 million visits this year just through June, with more than 15,000 on an average day. The total reached 7 million in 2014, excluding nearly 600,000 annual database searches. 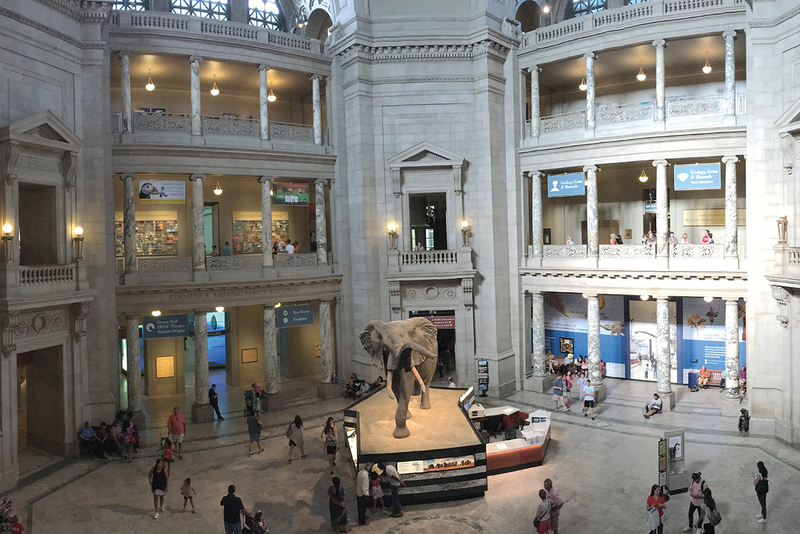 Each visitor has the opportunity to explore 325,000 square feet of exhibit space in the Natural History Building that occupies 1.32 million square feet on the National Mall. Others view the more than 3 million items loaned each year. One of 429 full-time employees, Hull-Walski has been at the museum almost 25 years. The College of Arts and Sciences Hall of Fame inductee was hired in 1992 as the Department of Anthropology collections manager. The position was not one she envisioned in her future while completing her master’s in historical archaeology at Illinois State. A native of Connecticut, Hull-Walski was fascinated with colonial history during her childhood. She was encouraged to attend ISU for graduate study while working at an historical archaeology site in Mississippi with alumnus Bob Sonderman ’76, M.S. ’79. She focused on historical archaeology at ISU under the leadership of now retired Anthropology Professor Ed Jelks and his wife, Judy. “They raised generations of archaeologists,” Hull-Walski said. Students bonded during digs that left them sweaty, sunburned, and for Hull-Walski, eager to examine what had been found. “I wanted to be in the field but soon realized many discoveries are in the lab. I liked that better because it was an opportunity to put order and structure to what was found,” Hull-Walski said. She came to that conclusion after working a range of locations including historic townsites in Mississippi, a Kansas fort and Ancestral Puebloan (Anasazi) sites on Colorado mesas. “Sometimes it’s great, but tin can after tin can after bottle cap and glass shard” gets tiring. “Not everything is valuable. We have to be very disciplined and make efforts to document some materials in the field and leave them there,” Hull-Walski said. That challenge has been an integral part of her job since she started at the Smithsonian as a collections manager in the Department of Anthropology. Her work involves securing legal documentation for every item. Beyond inspecting for pests when collections arrive and handling inventory tasks, duties include organizing, cataloging, photographing and housing each item. At the same time, it is critically important to look to the future. Enough variety of a specific treasure must be gathered to allow for serious research showing transition over time. An example is the extensive collection of pottery created by members of the Hopi tribe and dating back to the early 1600s. The teaching and research aspect of the Smithsonian’s collection is always a critical component to decisions made. It became an especially integral part of Hull-Walski’s four years of work as collections manager for the Office of Education and Outreach beginning in 2012. Her first goal was to handle collections’ management issues as the museum planned and installed Q?rius (pronounced “curious”), which is an interactive learning space that opened in December 2013 to teens and tweens. Last fiscal year drew 241,000 visitors—with 1,200 daily on an average summer weekend—all eager to examine the 6,000 objects showcased. Others explore Q?rius collections through the website (qrius.si.edu), which had more than 300,000 online views in 2015. The Q?rius collections are housed in archival boxes and have QR codes that link each specimen to an online profile that provides such things as scientific name, where it was collected and time period. Each container is color coded based on the amount of handling allowed. The precautions protect both specimens and visitors. Since its completion, visitors have exceeded expectations in their enthusiasm to study items under a microscope, do touchscreen activities, attend a laboratory class and meet visiting scientists. The opportunity to create such a vibrant learning space is definitely a capstone experience for Hull-Walski, who is passionate about her work. She is understandingly proud of her role in collecting, preserving and making accessible specimens and objects that document the natural and cultural history of our planet. She enjoys sharing her knowledge as an adjunct faculty at George Washington University’s Museum Studies Department and is thrilled to now work with fellow Redbird Cailin Meyer, M.S. ’12. Cailin completed her master’s in historical archaeology with a focus in zooarchaeology and joined the Smithsonian four years later in May 2016. More than anything, Hull-Walski delights in interacting with visitors and answering questions. There is only one inquiry that she shuns from those she meets. 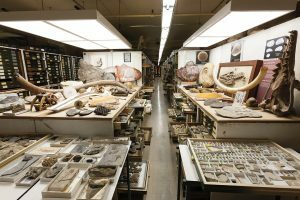 Most days Deborah Hull-Walski works behind the scenes at the Smithsonian’s National Museum of Natural History, navigating a maze of crowded storage space. Her office is equally hidden from public view, tucked away in what is affectionately known as the building’s attic. There are times, however, when she finds herself in the spotlight. Her role in researching iron coffins and their unidentified remains has led to an expertise that has captured national attention. 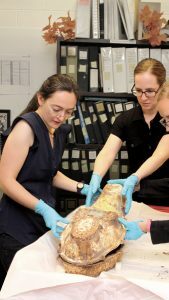 The work began in 2005 when the museum received a 19th century coffin recovered from an unmarked burial site in Washington, D.C.
She partnered with forensic anthropologists Doug Owsley, the museum’s chair of physical anthropology; and Dave Hunt, physical anthropology collections manager, to research the location. They learned through historical documents that Columbian College, with an attached cemetery, was once on the site. More research confirmed the coffin was made from 1850 to 1852, and the male clothing dated to the early 1850s. Hull-Walski, with a team of George Washington interns and other volunteers, searched obituaries and found records of three teen boys. The team began genealogical research to find living relatives, eventually identifying William Taylor White a the deceased. He was from Virginia but studying at the college. The work resulted in a proper burial for White at a service Hull-Walski attended. In addition, she has found close to 2,000 ancestors tied to the White family. Hull-Walski hopes for equal success in ongoing work with iron coffins removed from 19th-century cemeteries in D.C. and Virginia. She and Owsley are examining the remains and coffins from burial vaults, determined to learn the story behind each of the lives suspended in time.